Tamulpur Police in Baksa district on Saturday arrested two suspected members of the United Liberation Front of Asom-Independent (ULFA-I) for being involved in an extortion case. 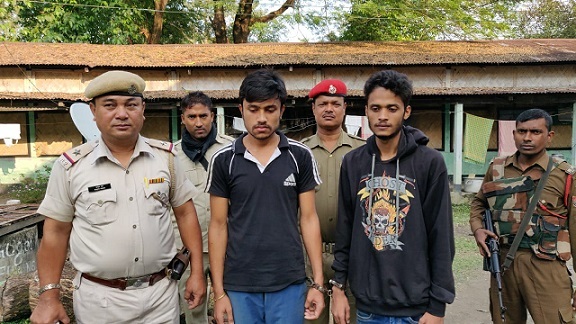 The arrested youths have been identified as 25-year-old Kushal Das, son of Ramcharan Das and 24-year-old Jagat Das, son of Jatin Das, of Pothalikuchi village under Tamulpur Police Station in Baksa district. According to information, the duo had been demanding extortion money from a Government employee – Anil Medhi – who has been serving as a worker of Tamulpur Development Block under Tamulpur PS. According to Anil Medhi, on November 4, he had received a phone call on his mobile phone from an unknown number, who demanded Rs. 5 lakh in the name of ULFA(I). After getting the threatening call, Medhi approached Inspector Ashim Bora, Officer-in-charge of Tamulpur PS. Receiving the complaint, police officer Bora started investigation with the help of Rajen Boro, in charge of Gandhibari Police Outpost. Tamulpur police were able to track the location of the mobile phone number which was used by the caller for demanding extortion money. On Saturday, Officer-in-charge of Tamulpur PS, Inspector Ashim Bora and in charge of Ganfhibari Police Outpost Rajen Boro launched an operation in Pothalikuchi village and nabbed Kushal Das from his residence. On the basis of the statement of Kushal Das, police nabbed another youth – Jagat Das from Changsari of Kamrup (Rural) district – on charges of being involved in demanding extortion money. Jagat Das works in a private company at Gouripur in Kamrup (Rural). A case has been registered against Kushal and Jagat at Tamulpur PS. Police Inspector Ashim Bora told media persons that police are yet to ascertain where the youths are ULFA (I) members or not. It will be clear only after proper investigation and interrogation of the duo.